I don’t know how many times I’ve read the stories of guys who chose against Grant Peterson’s recommendations. The theme of these stories, quite often, is to express remorse for not taking his suggestions sooner. They speak of how much they regret not raising their bars earlier, or they finally try platform pedals and regular shoes and are amazed how little performance they loose. Maybe, after poking fun at his retro ways, some become converted wool fanatics. Some of them learn a more expensive lesson. These guys have a frame for sale that is just a little too small. They want to sell it and buy the size Grant suggested originally. Now I have my own “Grant was right” story. I just installed wider bars on my A. Homer Hilsen and am surprised how much better they are. Like some of those other guys, I thought I knew better. After all, before Homer, I had two bikes. One had 41 cm bars and the other had 44 cm bars. 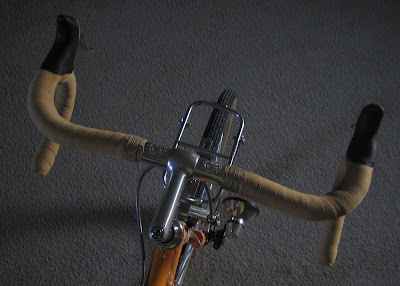 I liked the handling of the bike with narrower bars, so when I ordered the Rivendell, I ordered the 41. Grant suggested that I try the 44, but I said that I had tried both and preferred the 41. He said something about it being hard to argue against experience and gave me what I wanted. The problem was that I hadn’t done my experiments on the bike in question. So after a few hundred miles of my own internal mental nagging, I moved the wider bars to the AHH. The difference was surprising. The wider bars seem to have increased comfort and improved the bike’s handling. The improvement was at once delightful and humbling. Grant was right. Now, if he suggests something that appears to be utterly silly, I’ll probably give it some thought. For example, I think I might go back to the article on running with your bike up hills wearing a Sherlock Holmes hat (Pedal & Hoof, Pedal & Hoof, Rivendell Reader 37, Winter 2006) and give it another read. Yeah, I think he does think deeply about such things. He certainly has been key in creating a group of riders, who have bucked the mass marketed big company newer is better trends, and opted for the classic, refined and proven approach to cycling. I like it. Through thinking, experience, or both…he certainly knows what works well for the frames he has designed.